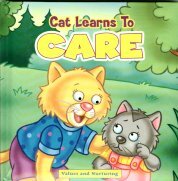 This little story book is from a series called Values and Nurturing. It tells the story of a little cat who helps a kitten find its way home. There are 8 gloss cardboard pages. The book is 6 1/2" square. Copyright 2005. Previously owned but in excellent condition.